"Doesn't it drive you crazy?" "Doesn't what drive me crazy?" I reply. They think about this for a moment. "Well... the traffic, for one thing." "Let me tell you something about traffic," I say. "What actually drives people crazy about traffic is that they can't get where they want to go and there's probably someone getting pissed off at them for being late. But that stress is with the passenger, not the cab driver. Imagine you were cruising around town with no place to go, just listening to the radio. You might find it relaxing. That's kind of what it's like to be a cab driver." This seems to make sense. Most people never looked at it that way. Then, just to have some fun, I will say this: "There are, however, two things that do drive me crazy in this business. But you'll never guess what they are." Passengers love this because it gives us a game to play. Can they guess what drives the veteran cabbie around the bend? "Nah... what would be stressful would be having to be around a mean person all the time. But when you drive a cab the mean people you do encounter are out of your life in ten minutes. That's one of the perks of the job, actually." By this time there is a long pause. They start to go for the long shot. "People who bring dogs in the cab?" "Of course not, I love dogs!" "Well, yeah, but that doesn't count 'cause it only happens about once a year." "That can be annoying but it doesn't classify as something that drives me crazy. Remember, we're looking for two things that are really stressful here." "No, come on, there's nothing wrong with a short ride." "People who don't know where they want to go?" "No, what do I care? The meter is running." "People talking on their cell phones?" "No, at most that is merely slightly annoying. Definitely not 'drives-me-crazy' material." Finally there is a long silence and I can see by the expressions on their faces that they're out of guesses and ready to give up. Drum roll, please. But before I give you the answers, I want to say that I think any cabbie in New York who's been driving for more than a year would agree with me on this. And I think you probably have to be on the inside of any activity in order to be able to correctly say what it is about that activity that most infuriates the people who actually do it. Outsiders aren't usually aware of the subtleties. 1. Any contact whatsoever with the Taxi and Limousine Commission. The TLC is the city agency which makes the rules for the industry and administers those rules. Although I admit that there have been some improvements recently, its history in my 31 years has been sordid. Without getting into a diatribe about the shortcomings of this bureaucracy, I'll just say that cab drivers have to accept whatever mindless or mean-spirited dictates come down the line (like televisions in the rear compartment that are under the control of passengers and blast out the same commercialized drivel over and over and over into the ears of the drivers) and that even the routine of renewing one's hack license every year has enough potential stress connected to it to make one dread opening the renewal form which arrives annually (maybe) in the mail. (One year, for example, I had to make seven trips to various city agencies to clear up the TLC's own bureaucratic errors.) I could go on and on, but I'm sparing you the horror. It's the second cause of stress that is by far the worst, however, and although it seems the most obvious to me, no one has ever guessed what it is. 2. I can't find a passenger. That's right. I am cruising the streets of the city and I can't find a damned passenger! Nearly everyone who ever takes a cab in New York assumes that cabs are always busy because whenever they want to get one, it seems it is difficult to find one that's available. This is true, but it is true only because the taxi business is a peak-hour business. During the rush hours (7 to 10 a.m. and 4 to 8 p.m.) demand exceeds supply. But that's only 7 hours of the day. There are 17 other hours and during many of them, quite the opposite is the case. Try getting a cab at 2 a.m. on a Tuesday night, for example. Before your hand goes into a full wave, you will find three or four empty taxis cutting in front of each other in their attempts to get to you first. The 13,187 yellow cabs in New York City derive all their business from street hails. You don't get on a phone and call for a yellow cab. You go out on the street and wave your hand. This means we're all in competition with each other and, when supply of cabs exceeds demand for service, it's a horse race, believe me. Did you ever dream of being a NASCAR driver? Come to New York and drive a cab at night instead. So how bad can it get? Twice I have gone two hours of desperately cruising the streets without getting a single fare. Being empty for 45 minutes is not all that unusual. And that is stress because you have paid a leasing fee for the use of the cab for a period of 12 hours and therefore time is money (or no money). It is also a bit humiliating in my case because, if I don't say so myself, I think of myself as the Grand Master of finding fares. So for me to go long periods of time trying every trick I know and still finding another empty cab in front of me wherever I turn, well... it can drive me crazy. I start behaving like the maniac taxi drivers I hear passengers complain to me about. Last week, for example, I was cut off viciously on 7th Avenue South by another cabbie who then beat me to a passenger standing off the sidewalk at W. 4th Street. Instead of shrugging it off and continuing on down the avenue to hopefully find another passenger, I tossed a cup of water through his window as I drove by. Idiotic, certainly, but it shows you how crazy even a non-crazy fellow like myself can get. I once had a passenger in my cab who was a waiter and we got into a conversation about our professions. He told me about his recurring dream of not being able to keep up with business in his restaurant. He said in his dream the space of the restaurant kept expanding and the tables extended out beyond the entrance right out onto the street. He would run and run from the restaurant out into the street trying to take orders and serve food, but the tables kept multiplying faster than he could cope. ...another yellow cab from New York City appears from out of nowhere, speeds through the intersection, screeches to a halt beside the limo, and picks up the stranded party people before I can get to them. And you know when you start having dreams like this that it won't be long before you pick up a couple of husky fellows in white coats who take you for a ride to the funny farm. Although, come to think of it, then at least for awhile there you would have had some passengers! It has also been rumored that failure to click here for Pictures From A Taxi can also cause one to go crazy. But that is just a rumor, of course. It began with a prearranged meeting at 6 p.m. with a couple of Australian journalists in front of the CBS Broadcast Center on West 57th Street. They had contacted me a few days prior with a request for an interview with a "real New York cabbie" about the election results. It was to be on a radio station known as 3AW in Melbourne with a talk-show host named Neil Mitchell, the most popular talk radio guy in those parts, I was told, with an audience of a million people. So off I went at the very beginning of my shift to the CBS building and there I met my two Aussie contact fellows, Justin and Sebastian, who climbed into my cab. We chatted for a few minutes and then I was handed a cell phone. On the other end was what might be called a Professional Voice. Do you know how someone sounds who speaks for a living? It's smooth and kind of resonant without the "umms" and "uhhs" that punctuate the sentences of non-professionals. It was Neil Mitchell, and we were on the air in Melbourne. I was asked a few questions about the election and about taxi driving in New York. I thought I answered them adequately and then, after less than a minute - zip - it was over. I had another five minutes of conversation with Justin and Sebastian and then - zip - they were off to attend to other matters and were gone. I drove down the street, picked up my first fare of the night, and the rest of my shift was underway. But as I headed toward the East Side with my passenger, something didn't seem quite right. They had told me that I had just communicated to a million people and yet it felt like nothing. There had been no feedback. I mean, when you communicate the idea is that there's someone on the other end to receive it and an effect is created, right? Here there was just a vacuum, and it was unsatisfying. And worse than that, I had intended to mention the name of my blog on the air but the thing went by so quickly that the opportunity had slipped right past me. So I felt a bit frustrated, as well. However, I took it as a learning experience - practice, really - because I knew there would be an even bigger fish to fry that very night. Just before I'd left my house to drive into Manhattan I had received an email from a contact person from the BBC asking me if I'd be interested in appearing on one of their shows, BBC Breakfast, at 3 a.m. They also were interested in interviewing a real New York cabbie to get a local reaction to the election, and I had called the number they'd given me and accepted the invitation. Now you have to understand, I am not a movie star nor a head of state. I am merely a New York cab driver. I am not used to receiving one - much less two - invitations to go on the air in the very same night. So my mood was elevated and this helped me to have a better than usual night as a member of my own profession, culminating in a lucrative out-of-town job to Ridgewood, New Jersey, that on any other night would have been the highlight of the evening. In fact it was during the return ride to the city from Jersey, just as I was crossing the George Washington Bridge, that I received a phone call from Emily, the charming producer of the show, who asked me to bring my cab right up to the site from which the show would be broadcast, the Skylight Diner at the corner of 34th Street and 9th Avenue. The plan was that I would be interviewed while sitting in the taxi. In speaking to Emily, I found out a bit more about BBC Breakfast. It turns out to be Britain's primary early morning show on the "telly". It's on the air every day for three hours and has an audience all over the U.K. of - gasp - FIVE MILLION PEOPLE. Somehow the concept of five million viewers in the U.K. was much more intimidating than one million listeners in Australia, which I took in stride. I did the math - I get about 50 people a day in my cab. I would have to drive 100,000 shifts to reach five million. And it would take me 274 years to do it if I drove every day of the year. "The Revolution is here. I am your leader." "All of you children watching, go to Mum's pocketbook right now and send the money to ______ (my address)." "You have been abducted by aliens but when I say the words 'fidgity-doo' you will remember none of it. Fidgity-doo." Of course, I said none of these things. What happened was I arrived at the diner at 3 a.m. and was greeted by Emily. It was an interesting sight, actually, to see this 24-hour diner with so much activity going on at that time of night. The streets in that area are quite deserted at 3 in the morning, yet here was this hub of busy-ness with the ability to transmit images and sound to the other side of the planet. I know we take this technology for granted now but, really, that is incredible if you think about it. Emily briefed me on what was to happen which was that in about half an hour the show's host (or "presenter", as he is called) Bill Turnbull, would come out to the sidewalk, approach me in the cab, and ask me a few questions. That was all the preparation I had. So for the next 30 minutes I hung around the diner watching how the show is done while other guests were interviewed, and then, at the appointed time, I went into my cab. Out came Bill Turnbull - lights, camera, action - and the interview was underway. and about being a taxi driver in New York, and was about to wrap up our little chat when I realized the moment of truth was at hand. If I was going to let five million people know the name of my blog I was going to have to act boldly. Even though he hadn't asked me, I acted as if he had and shamelessly let the plug drop. 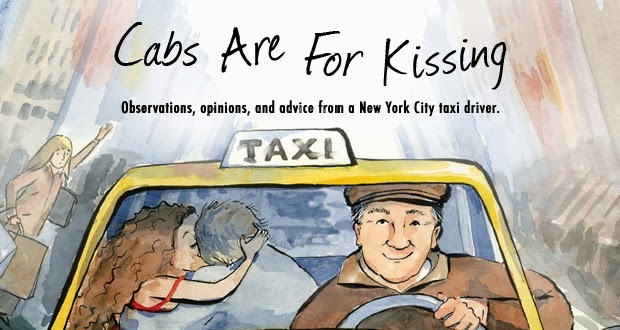 "The job is so adventurous," said I, "that I started writing an online blog called 'Cabs Are For Kissing'." And then, bless his heart, Bill Turnbull picked right up on that and repeated the name of the blog for all to hear again. The result: over 3,000 hits and more than 50 comments and emails from all over Britain. And that is a great, great feeling to know that an individual can create what is essentially a personal magazine from his own home and have that kind of reach around the world. Mind boggling, really. And so I'd like to thank everyone who took the trouble to find me here. Welcome aboard! Please come by often, and I'll try to keep it interesting for you. And if that's not enough and you want even more New York, just click right here for Pictures From A Taxi.